LOVE BEING A NONNY! : All Together For The First Time! All seven grands together for the first time. Nonny and Poppy are blessed! That is the sweetest picture ever! I see the love light in your eyes. So special to share this with your husband. My kids have a Poppy too. Oh how sweet! I love the little pirate in the middle! I'm so so happy for you...I have only experienced them all together once and it was the best day ever!! You are blessed indeed, what a great photo too. What a beautiful family! I can see and feel the joy this moment. I am so happy for you! That pictures is adorable and oh so precious. ((HUGS)) You are blessed! Oh my! What a fun time you had to have had surrounded by those precious babies. Truly blessed! They are all just adorable. You look so happy. This picture is ouzzzzzing with cuteness! I LOVE how the two of you are looking at each other instead to the camera. My photographer's heart did a happy sigh when I saw that. :-) Absolutely gorgeous family. I have really enjoyed reading through your latest posts. Congratulations on another grandchild on the way. We have similar details in our lives. 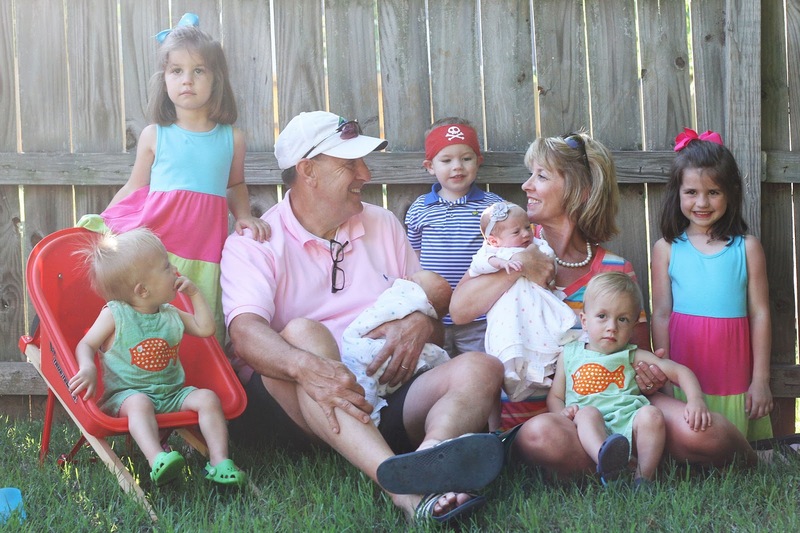 I have 8 grandchildren, and active, fun twin boys too. Our granddaughters have the same dresses as your two have on here in this post. Thanks for blogging!